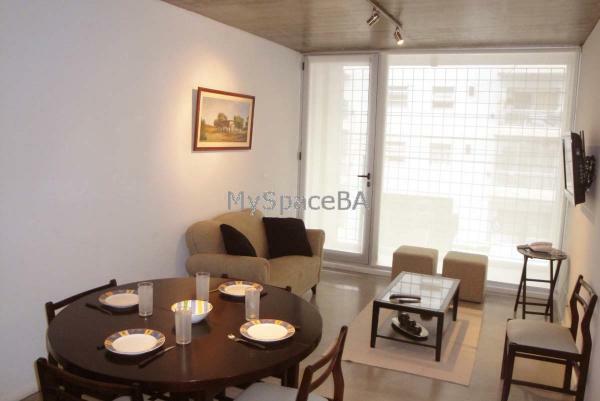 Beautiful one bedroom apartment located in Palermo Hollywood. Living room, dinning area. Open plan kitchen. Guest toilette. Full bathroom. Bedroom with Queen size bed. Aircon . Cable TV. Wi Fi. Landline phone. Washing machine. Nice and bright apartment. Wi Fi . Cable TV . 2 aircons cold /warm . Landline telephone. Iron . ironing board. Ample closet. Guest toilette. Brand New Building. 24 hs doorman. Swimming pool for summer season. Elevators. Located in Palermo Hollywood. Great restaurantes. Banks. Bus routes. Included: All the expenses are paid by th e owner.